Tea Tree Oil is extracted from a plant in Australia and does not naturally occur anywhere else. It’s a topical remedy and should never be ingested. Tea Tree Oil has a variety of properties: It’s a topical antiseptic, anti-fungal agent and it reduces infections. It’s very effective for skin conditions. Please note the warning about not using Tea Tree Oil on babies younger than 6 months of age. It helps to heal various skin conditions. It can be used to repel certain insects. It’s great for household cleaning: carpets, kitchen cleaners. She mentions using Tea Tree Oil for gargling. If you swallow Tea Tree oil while gargling, it can have toxic side-effects. I don’t think it’s worth the risk. I think most f the suggestions in this article are really good. But I wouldn’t ingest Tea Tree Oil and I keep it away from pets. 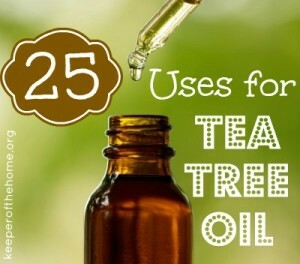 Click the 25 uses for Tea Tree Oil link below to see.